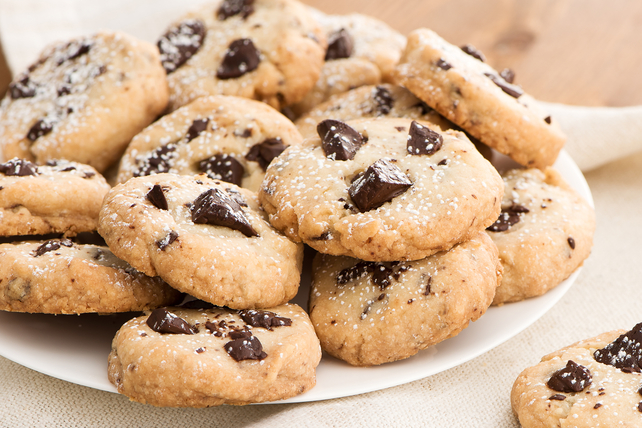 This super-easy shortbread cookie recipe is a definite chocolate hit! Big chunks of semi-sweet chocolate stud this melt-in-your mouth shortbread. 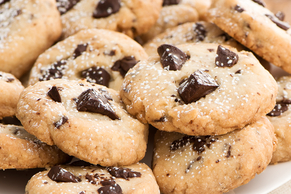 You will never need another shortbread recipe after trying these delectable festive cookies. This shortbread recipe makes an excellent gift – if you can stand to give any of it away! Combine flour and corn starch. Beat butter and superfine sugar in large bowl with mixer on high speed until light and fluffy. Gradually add flour mixture, mixing well after each addition. Stir in chocolate. Drop heaping tablespoonsful of dough, 1 inch apart, onto baking sheets. Bake 20 to 25 min. or until lightly browned. Cool 5 min. Remove to wire racks; cool completely. A hot cup of brewed Maxwell House Coffee pairs well with this rich and delicious shortbread cookie. For a change of pace, try our Chunky White Chocolate-Cranberry Shortbread recipe or Chunky Chocolate-Orange Shortbread recipe. Superfine sugar, also known as fruit powdered sugar or instant dissolving sugar, is a quick-dissolving finely granulated sugar. If you cannot find superfine sugar, you can make your own by processing granulated sugar in a food processor or coffee bean grinder until finely ground.